PRICE: $ Can frequently be found for under $20 at swap meets and auctions. The Emil versions of the 109 received the much-improved Daimler Benz Db-601 engine replacing the underpowered Jumo engine. The E-3 in particular took advantage of the 1200 H.P. DB-601a, with a top speed of 350 M.P.H., stronger canopy and armor, and upgraded weapons. Its wing machine guns were replaced with MG-FF 20 MM cannons. A good match for the early Hurricanes and Spitfires, the 109 remained in service for the rest of the war. For more history see the dozens of reviews here at Modeling Madness or Google Bf-109. The first thing you notice is a huge box, but don’t be fooled. Once you open it the contents will fit in half the box, way too much space. What you will find inside is 4 sprues unbagged and rattling freely in an oversized box. With any luck the clear sprue will be on top and unscathed. 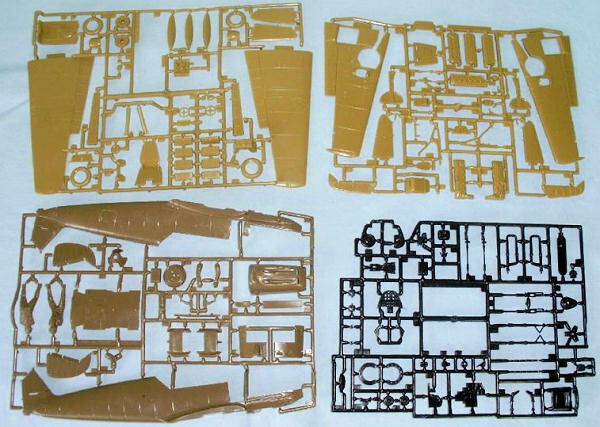 The plastic is typical of Matchbox, hard and almost flash free and in 3 colors, tan, brown, black and the last small sprue being clear. There is a total of 145 parts. The parts are nicely molded and a mix of raised and engraved. Notice I didn’t mention trenches, as this kit doesn’t seem to be as bad as a lot of Matchbox kits. What is nice about this kit is you are given a decent engine, which with a little wiring would be an excellent model in itself. And 2 MG-17, 7.92 MM machine guns, which are very well detailed in the engine cowl above and behind the DB-601a. Also included in the kit are the wing cannons, which are nicely detailed and can be seen if you leave the cover off the bottom of the wing. The cockpit has decent details with various levers and knobs. With a little scratch building it would be an excellent representation of the real thing. Also included is a pilot figure (if you like). On the down side the canopy is overly thick. This is very noticeable and if I were going to do anything aftermarket, it definitely would be to replace this. It is however done in 3 pieces so it can be opened. It is of the wrong type, being flat, as were the E-4’s. So technically, you can’t do an E-3 with this canopy. I would also like to note that the rudder and flaps are separate so they may be poseable. The instructions are large, very well done with exploded views showing you where the par ts go and numbering each part. Painting is done with reference to Humbrol paints, but most 109 folks know the colors and will use the brand of their choice. The decals are for 3 versions, the first a Bf-109E of Adolf Galland, JG-26 in 1941 with his famous Mickey Mouse character on the fuselage. Second is a Bf-109E of the Slovakian Air Force at the Russian front southern sector in 1942. Third is a Bf-109E of JG-2 at Le Harve, France in 1940. The decals look nice with minimal stenciling for some of the warning symbols but mine were destroyed over time and had gotten wet, I definitely will replace them with aftermarket ones of better quality. One odd thing about the decals is all three planes are said to be w/nr. 6356. This definitely baffles me.